Support Vintage Band Festival With Your Donation Today! • Any Donation is Greatly Appreciated! 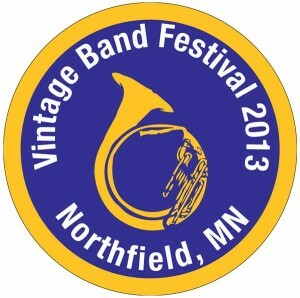 • Donate $25 and receive the classy Vintage Band Festival 2013 Commemorative Pin. Wear it between now and Aug. 4, 2013 and people will wonder where you got such a cool pin and you can let them know about the upcoming festival with four days of 30 Bands and 100 Concerts! This pin, by they way, gets you in to all events (except some receptions). $25 is our minimum gift suggestion. • Donate $150 and you’re a Silver Cornet Donor! That will also get you your pin, reservations to the Limited-Seating Events, VBF opening reception reception invitation, a T-shirt, Souvenir Poster and our sincere THANKS! • Donate $250 – the Golden Euphonium Donor Level your enjoy all of the above, and you’ll also get a personal invitation the International Musicians’ Reception on Wednesday evening August 1.